There are good reasons to be optimistic. Nicaragua—now with a median age between 26 and 27 years—is no longer a youthful country. Fertility declined from around 6 children per woman in 1980 to about 2.2 today, gradually shifting Nicaragua into the intermediate phase of its age-structural transition, which (according to the National Intelligence Council’s Global Trends report) stretches from a median age of 26 to 35 years. 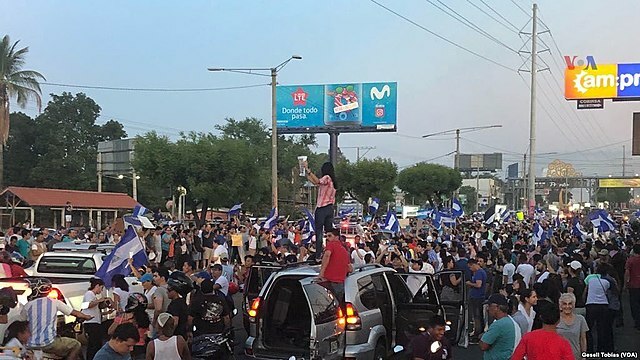 As Nicaragua’s population heads deeper into this intermediate phase of the age-structural transition, the country’s chances of becoming a stable liberal democracy are expected to increase. While odds are against it now, by 2025, Nicaragua should have a 50-50 chance of being ranked as FREE in Freedom House’s annual assessment—a milestone that many analysts use to identify liberal democracies. What’s so special about the intermediate phase? 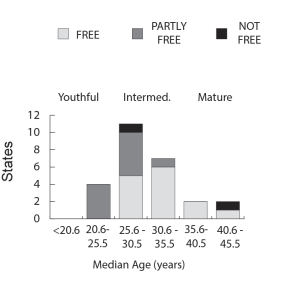 It’s the demographic window—a period in which childhood mortality generally drops to levels closer to those seen in developed countries, educational attainment rises rapidly, economies reach the World Bank’s upper-middle income level, and about half of all countries receive Freedom House’s FREE rating (Figure 1). Fig. 1. The current Freedom Status of countries with a population of more than 500,000 in North America, South America, and the Caribbean, by median age. Data are from Freedom House (2018) and the UN Population Division (2017). Age-structural categories (NIC, 2017) are noted above the graph (youthful, intermediate, and mature). Entering the demographic window doesn’t mean that Nicaragua will face a turnaround in economic, social, and political development this year—or even in the next five years. However, by moving deeper into the age-structural transition’s intermediate phase, Nicaragua will leave behind a set of age-structural configurations (commonly called “youth bulges”) that have done nothing to help ease pressure on its education and health care services, to reduce unemployment, or to boost government revenues and investments. While Nicaragua’s age structures will, over the next four decades, be much more fiscally advantageous than in the previous four, its leaders will need to make smart public and private sector investments to take advantage of the rise in educational attainment that characterizes the demographic window of opportunity. Nor is liberal democracy guaranteed; recall that political rebellion in the transition’s early intermediate phase served as an excuse for Venezuela’s Nicolas Maduro and Turkey’s Recep Erdogan to jail the opposition, intimidate the press, eliminate democratic institutions that limited executive power, and consolidate power in a new election. Ortega could take similar action. Political instability comes in clusters. The majority of today’s revolutionary conflicts and waves of out-migration can be traced to a handful of persistent geographical clusters of youthful countries: the Mashreq-Levant (including Iraq and Syria), the greater Sahel, Yemen-Horn of Africa, tropical Africa, and south-central Asia (Pakistan and Afghanistan). Each represents a group of states with similar youthful traits: political fragility, poorly performing institutions, and large proportions (and growing numbers) of young people in need of adequate services and jobs. In contrast, the Western hemisphere’s last youthful cluster—situated at the midriff of Central America—is fading. Guatemala, with median age (MA) of 22 years, and Honduras, now at MA 24 years, are the only youthful countries that remain in what was formerly a more extensive, and perpetually unstable, Central American cluster. Demographic changes that have taken place in Nicaragua and El Salvador (now at a total fertility rate of 2.1 children per woman) should be regarded as hopeful signs of future economic and social development during the 2020s. Only two other youthful countries (with populations of more than 500,000) remain in this hemisphere. One is Haiti (MA 24 years), the final remnant of a small cluster of youthful island states. The other is Bolivia (MA 25 years), the last of a highly volatile–and sporadically violent—youthful cluster that once spanned the length of the Andes. Nonetheless, organized criminal violence is likely to continue to hamper development in Central America’s “triangle” through much of the next decade. Once established and flush with cash, narcotraffickers have, historically, been more difficult to subdue (and better funded) than revolutionaries. To its government’s credit, however, Nicaragua has largely kept the most powerful gangs out. In fact, while its populace is among the poorest in Latin America, Nicaragua maintains one of the lowest homicide rates in the Americas. During the 2020s, economic and social development in Latin America could vastly change the pattern of Central American migration. For Nicaraguans, it already has. Currently, most Nicaraguan migrants travel next door to work in Costa Rica’s growing economy. According to some estimates, Nicaraguan-born migrants already make up about 10 percent of the Costa Rican population. Similarly, investments in El Salvador that reduce gang violence and improve economic conditions could encourage more Guatemalans and Hondurans to seek work closer to home. The UN Population Division’s projections are clear on this point: Most of the region’s countries are scheduled to pass through the demographic window over the next three decades. If demographic history unfolds as it has in the past, their social and economic indicators are set to vastly improve. Possibly, a “Latin jaguar” economy (or maybe several) will emerge. By seizing the political will to make investments and reforms that reduce the gaping educational and economic disparities constraining their economies, a few Latin American states could ascend to positions of global economic, technological, and trade significance—much like the East Asian tigers, which broke into the demographic window just three decades ago. Photo Credit: Protests in Managua, Nicaragua, April 2018, courtesy of Voice of America.